When I became a mom, my world changed forever. When I became an aunt, my world changed forever. There is something about giving love unconditionally to a small being and allowing that being to blossom. Mothers, aunts, grandmothers everywhere today will be honored this weekend for mothers day. Yet I say to all - why one day? Why not everyday? Why wait for one special day to tell her that you care for her? 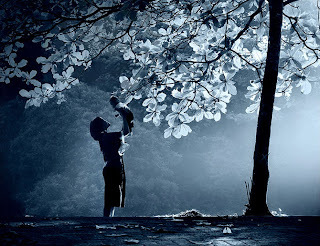 My appreciation for my mother grew because I finally understood the task that had been entrusted to me. I had respect for mothers everywhere. We are given the task of raising a human being and that is a daring adventure. It grows, it becomes a living being and it is part of us. And to see God's creation - a tiny little being - vulnerable that has been entrusted to our care. we watch as the being grows, pouring all our love, all our energy into making the child strong, bold, and couageous enough to face the world. we fight to ensure there is stability in our child's lives. we fight so that our children's needs are met financially and socially. we fight so that our children have a sense of security. Even the most timid person will become a lion if she feels her children are in danger, that is the power of a mother. I find that the task never ends. Our child could be 20, 30, 45, 65, 70, and we will always be a mother. till we are strong enough to walk on our feet. A mother can also be our critic and often times will tell us things no one wants to hear. A mother also has to learn and watch their child fall and get up so they can be their own person.. I lack patience and yet being a mom - it has taught me patience. The most difficult thing for a mother sometimes is watching their child in pain and not being able to help them with it - it is one of life's biggest lessons. A mother is all that and more. The job never ends. It is 24/7 and that role stays with you till eternity. Our biggest tasks as mothers is living true to our True Selves - and allowing that to flourish. By being that, we allow our children's authenticity to flourish. So on this day - and I would say do it more than once a year, take the time to tell your mother how much you care for her. Appreciate her and value the hard work she does to bring you up. It takes strength to raise a child. It takes courage to raise children. It takes patience to raise children. Most of all realize that our mothers are human beings just like everyone else. They come with a past, and with that past, they were entrusted with our responsibility. We are not given training as mothers, we just do it instintively. We sometimes have to use common sense, and other times our intuitive powers come into being. Mothers day is also about forgiveness - understanding that our mothers are human, and forgiving them for their mistakes. And use the time that you have with them in a more nuturing way. For those of us that are mothers - take that day out for you - do something for yourself- honor yourself for the magnificent job that you have done - treat yourself to something that you would not think of and make a pact to yourself that you will do it more than once a year. Do an internal check with yourself - Are you being authentic to you and showing that piece to your children? I came across this article, about journaling prompts for mothers day....and would like to share with you.. If you don't journal, I encourage you to do it if you are a mother. There are so many types of journals for mothers - I remember a journal that my cousin gave me on recording memorable moments throughout motherhood that you can pass on to your children. It is a great way to record traditions, it is a great way to have memories on paper and it is a treasure that can be passed down. Another form of journaling is making a scrapbook. Another form of journaling is a Gratitude Journal for Mothers. And last but not least, I have a journal to my son - where I write him letters every now and then about important milestones in life that as a child he may not udnerstand, but as an adult if he read it he may be able to put things in perspective. I wish all mom's a very Happy mother's day!!!! !